What a “death promise” is, much less how it could come to get me, is beyond me. 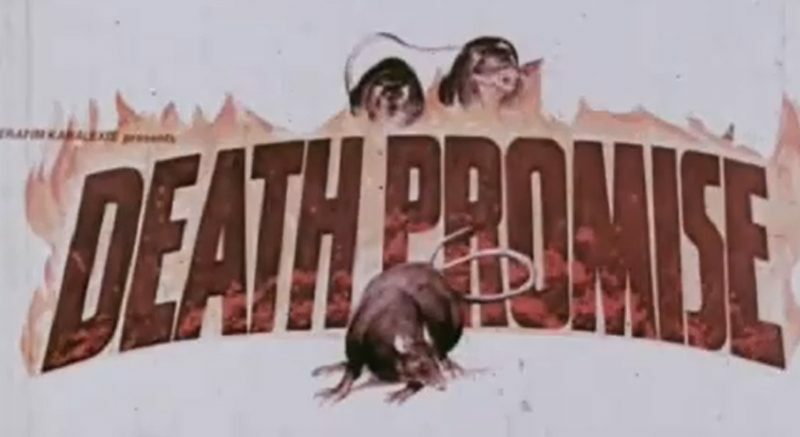 But I do know that Death Promise is a top notch example of a low-budget action flick, where you can barely see or hear any of the actors but the boom mic is easy to find. A must- if you can find it, anyway. It takes a lot of guts to stand up to rich landlords, which is a shame because the landlords hire some goons and tear all of said guts out of Louis’s body. Apparently Louis hadn’t learned the first rule of dealing with “the bastards”, the one about not letting them get you down. Charlie is devastated at the loss of his father the punching bag; Speedy is probably supposed to be sad too, but his acting range is such that he can only stare blankly at Louis’s corpse and mutter “Aw, damn.” Charlie wants revenge, but a) he doesn’t know who killed his dad and b) isn’t good enough at martial arts to kill them even if he did. But then, a stroke of luck! Charlie and Speedy’s sensei, Master Shibata (Thomson Kao Kang), has the names of the fatcats who ordered Louis’s second-most famous beating, and he refers Charlie to a sensei who can train him well, though why he doesn’t just do it himself isn’t explained. So Charlie goes to Master Ying’s countryside academy of getting helluvatough. Master Ying wears the worst-looking fake beard in movie history and speaks in Yoda-like parables. “This is Sup Kim,” Ying says as Charlie meets his new training partner. “He is, personally, my only other student.” Charlie looks confused and takes his shirt off and eventually learns how to dice a smallish tomato with a throwing star from 3-4 feet away, which is good enough for him to, personally, graduate. Speedy, meanwhile, has stayed in the city, investigating the villainous real estate tycoons to make killing them a little easier. Charlie returns to the city, ready to try out his new skills, none of which are acting skills, unfortunately. They make a pact to pay each of the five fatcats back for Louis’s death in clever and gory ways. At long last, the landlords are dead and Louis’s death is avenged- or not! In a twist as ugly as the Reverend Horton Heat’s dental records, the mastermind behind Louis’s murder is revealed to be Master Shibata, who is so evil that he carries around a cat like Blofeld in the James Bond movies. Charlie fights Shibata and somehow wins, which is a bittersweet victory because in killing off Shibata and the landlords, he and Speedy have killed literally every single investor in their scummy neighborhood. So much for saving the slums in Dad’s name, eh, Charlie? Death Promise is a riot to watch, and is probably bad enough to incite a riot under the right circumstances. It’s certainly worth tracking down if you can find it, but I can say from experience that it’s no easy task- I finally found my copy on Amazon after a couple years of searching. But it’s worth the effort, my man- it’ll blow your mind!